In 2017, Trafford Council and Salford City Council embarked on an innovative joint business venture to co-locate public space CCTV monitoring and emergency out of hours call handling services. Trafford’s CCTV control room was previously based in Stretford Police Station with an outdated and disparate CCTV system that had been expanded in an ad hoc fashion and lacked cohesive manufacturer support. In 2010 Salford City Council, when faced with similar challenges to Trafford Council, took the decision to convert a large basement into a British Standards accredited CCTV Control Room of excellence. The large availability of space, together with its close proximity to Trafford Council, ideally lent itself to this joint business venture. Replacement and upgrade of all public realm cameras. The level of technical knowledge that was required by the project team to manage contractors in this complex and technical project. Our experience taught us that it was essential to have direct access to highly developed technical knowledge; enabling us to assess the specifications and performance of our external contractors and supply chain. We were able to access this technical expertise from Salford Council but would recommend others to carefully assess this at the outset. The need for accurate ‘as is’ technical specifications and equipment logs. The nature of Trafford’s multiple and archaic systems meant that our technical installation works were hampered by the uncertainty of equipment and the lack of data we held on the routing of CCTV images. Our advice is to ensure that all contracts include a requirement to maintain an accurate asset log and technical file. Negotiations with Staff, Unions and Partners were very delicate. This took time and required open and honest communication and sign off at both Corporate and Political level. Our advice is to not forget the importance of bringing staff with you on the journey or the need to build a trusting relationship with partner organisations. 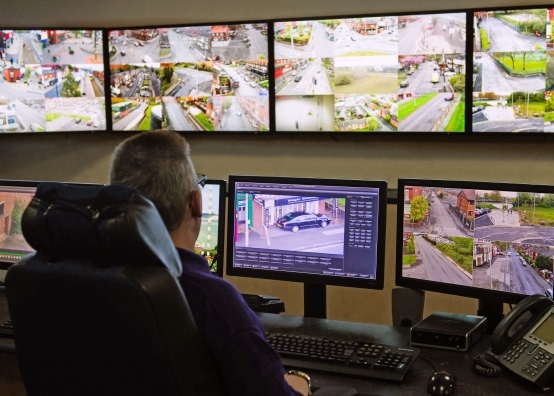 For Trafford, a clear benefit of the programme was the installation of 82 quality, high definition ultra-low light night vision Hikvision cameras, 23 cameras were reconfigured, and 27 were decommissioned as an outcome of the comprehensive mapping exercise. Trafford were able to take advantage of a supplier price discount to instruct the installation of 20 additional CCTV cameras, instead of their planned reconfiguration, all without any additional impact to the budget. The new cameras and software will provide a new income stream by improving the ability to market the service to third parties.